A little similar? The similarities end there however as the Axon is built on the F-53 chassis, not an E-Series (despite what MHSRV would say--I looked up the VIN of one of them). Fleetwood seems to go to great lengths on the website to not specify its on an F-53 chassis (which makes me think they are trying to compete with Axis/Vegas units with these). Thus being a smaller motorhome (26' for the small one) on an F-53 gets you an extra 25 gallons of gas (80 vs 55) and a bit more fresh and waste tank capacities. Not to mention slightly larger insides because the F-53 is wider. I don’t see it as much of a direct competitor of the Axis/Vegas line. It’s much closer to an Ace if anything. Specs show it’s on an F-53, with body width and height much closer to full-size Class As like the Ace; not the narrower and lower Axis/Vegas. I’d stay away from a motorhome that long with 158” wheelbase (hard to believe it’s not a misprint — what are these guys thinking if it’s actually that short?). The 25S at 26’-8” is over a foot longer than your Axis 24.1, yet the wheelbase is 30” shorter. Seriously? And to make matters worse, it’s carrying the weight of the slideroom and also the bathroom, and most likely at least the black tank, behind the rear axle. Not only does it have a very short wheelbase, along with a huge and heavy rear overhang, but it’s a box 12 feet tall. I feel I’m a pretty good driver, but I doubt I could keep that thing going straight on a windy day. From my perspective the design seems misguided (had a few other words but hate to sound that negative). Yes, that is interesting. The uninitiated will not realize the perils of a tail like that, so they will probably sell a few of these. May not take long for these to be traded in on something that drives better (like a Vegas or Axis)! They say imitation is the sincerest form of flattery! I agree that too short a wheelbase isn’t a great idea, although I’m not sure there is anything “normal” in the RV industry. I think designers build whatever they want based on what they think people will buy with little regard to how it may affect function. Both E-Series and F-53 are available with 158” wheelbase, but I see very few F-53-based Class A motorhomes that short. On the other hand the 158” E-Series is very common on Class Cs below 25 feet in total length. For comparison, all Sprinter Class As and Cs are 170”, and are “normally” limited to 24 ~ 25 feet. Their WB ratio is a little better, which may contribute to their better handling and stability. As I’ve mentioned before, I’m still puzzled why they don’t use the E-Series 176” WB chassis for mid-size Cs (25 ~ 28 feet) instead of stretching the shorter 158” WB. I recall only seeing specs for one Class C with 176” WB. The Axon shown is the 29m. I think it has 190 wheelbase. My buddy tows with a four winds class c on 158 wb. He cannot run as fast as I can on road. Not that it is a contest but my 188 wb seems to much more stable. Another friend has a 158 wb jayco and got rid of it. The 27.5 long and 158 wb F53 made him uncomfortable driving. He went through arbitration and got an F550 based super c.
I asked what the cargo capacity is on 29m but have not heard back from mhsrv. What do y'all know about the Thor freedom traveler? Again Thor's website *scratches head* no brochures but I think is a 158" class a 28'? You are never old until regrets take the place of dreams! 28' on 178" or 32' on 209"
Yes, that looks like 29m, which is 31 feet on 190” WB. That’s 51%, whereas shorter model is 28’-6” on 158” WB, making it 49%. Your concern over cargo capacity is a good one. Specs only show axle capacities of 6,500 and 11,000 pounds, which probably means 16,000-pound GVWR. If correct, that may not leave a lot of load capacity given it’s 31 ft with full wall slide. Yes, I feel much more "secure" with our 25.2, 26.5 feet with 194" wheelbase. I think that the ratio of wheelbase to total vehicle length, while a good indicator, can be deceptive and difficult to relate to because the magnitude of the numbers don’t change as much as what we want to know. I would prefer a ratio that addresses the rear overhang more directly since that’s what we are more focused on. Granted it will be more difficult to obtain because manufacturers don’t always list front or rear overhangs. As an example, the Extended ProMaster van used to build the Travato motorhome has a rear overhang of only 34% of the wheelbase. By comparison, we can roughly estimate the Reno’s rear overhang at about 80% of the wheelbase (by assuming front overhang is in range of 36 inches long). Even if the 36” front overhang guesstimate is off a bit, the Reno numbers are still very high (in order of twice as high) compared to a factory vehicle like the extended ProMaster used for the Travato. To me, anytime the rear overhang exceeds 50% of the wheelbase, the motorhome starts to look out of proportion. And I’d guess crosswind stability isn’t great either. I don’t think it’s too short. The Winnebago 26ft Vista has been on the 158 inch chassis for years now. Actually I see this line as a direct comps for the Winnebago Vista line. It’s a good size with lots of storage. I think it looks cool but I just can't get passed the color scheme. I agree on also competing with Vista, although to Jamie’s point the names obviously parallel Axis and Vegas. Winnebago does a great job with the Vista 26HE outside storage at 117 cubic feet, but the Reno 25S is only listed at 40 cubic feet. The Winnebago has a nice garage under the rear bed, much like many European motorhomes (just not as large). The Reno because of rear slide and bathroom doesn’t compete well in outside storage. 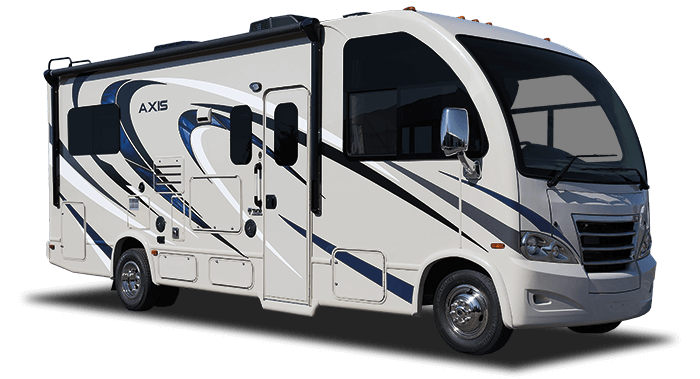 Since most Axis/Vegas floorplans are of equal length or shorter than the Winnebago Vista 26HE, are you suggesting Thor could have left the chassis at original 158” wheelbase instead of stretching to 188 or 194 inches? Why go to expense and trouble? I cringe when people start getting hot and wet over how much storage a given unit offers. People put way too much stuff in their units (and never use it) and this extra weight contributes to many performance problems....I think! I met a service tech at a CG a couple years ago and this is exactly what he said...over weighted campers and abused tire pressure accounts for 90% of road problems. Be careful. Hey! I resemble that remark I love the outside storage in our 24.1: It consumed everything we had in the basement of our 5th wheel except the kingpin tripod stabilizer (which obviously isn't needed in the Axis). In addition: We use everything I put in there at least once every season (well ok, except every tool in the emergency toolbox--thankfully). That's funny!! I hear people say..."we sold the house and moved into the motorhome". I hope they don't get behind me coming down Monte Eagle! !